The inspiration for the Draftsman Quilt is the kantha style of intricate hand stitching together layers upon layers of speckled indigo stripes and banding on a crisp white backdrop. You get texture. 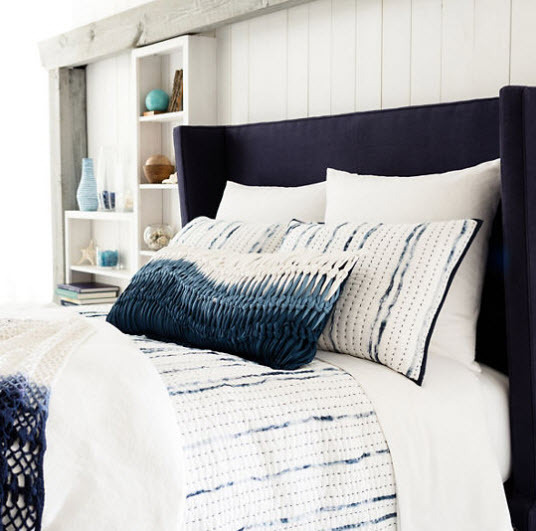 You get the boho look, yet, delightfully coastal too. 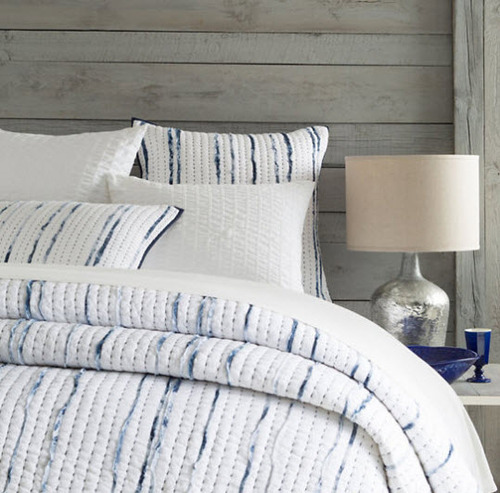 They mix and match nicely with our other indigo and blue bedding. - 100% cotton voile; 100% cotton batting. - Solid indigo band/hem on all sides. - Envelope back with ties. Care: Machine wash cold separately with mild detergent. Hang to dry. Do not bleach. Do not dry clean. Twin measures: 68" x 86"
Queen measures: 92" x 96"
King measures: 110" x 96"